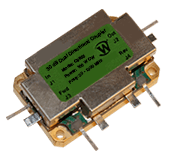 Werlatone's newest 20-1000 MHz, 30 dB Dual Directional Coupler, is the non-connectorized Model C9655. Rated at 100 W CW, this compact unit measures just 1.5 x 0.95 x 0.55" and weighs only 0.8 ounces. Supplied with a Tab interface, the C9655 operates with a maximum of 0.7 dB insertion loss, and is designed to operate, at rated power, into a 3:1 Load VSWR. Werlatone’s newest 20-1000 MHz, 30 dB Dual Directional Coupler, is the non-connectorized Model C9655. Rated at 100 W CW, this compact unit measures just 1.5 x 0.95 x 0.55″ and weighs only 0.8 ounces. Supplied with a Tab interface, the C9655 operates with a maximum of 0.7 dB insertion loss, and is designed to operate, at rated power, into a 3:1 Load VSWR.